Abstract. Within the framework of the PAGES NAm2k project, 510 North American borehole temperature–depth profiles were analyzed to infer recent climate changes. To facilitate comparisons and to study the same time period, the profiles were truncated at 300m. 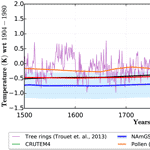 Ground surface temperature histories for the last 500 years were obtained for a model describing temperature changes at the surface for several climate-differentiated regions in North America. The evaluation of the model is done by inversion of temperature perturbations using singular value decomposition and its solutions are assessed using a Monte Carlo approach. The results within 95% confidence interval suggest a warming between 1.0 and 2.5K during the last two centuries. A regional analysis, composed of mean temperature changes over the last 500 years and geographical maps of ground surface temperatures, show that all regions experienced warming, but this warming is not spatially uniform and is more marked in northern regions. How to cite: Jaume-Santero, F., Pickler, C., Beltrami, H., and Mareschal, J.-C.: North American regional climate reconstruction from ground surface temperature histories, Clim. Past, 12, 2181-2194, https://doi.org/10.5194/cp-12-2181-2016, 2016. 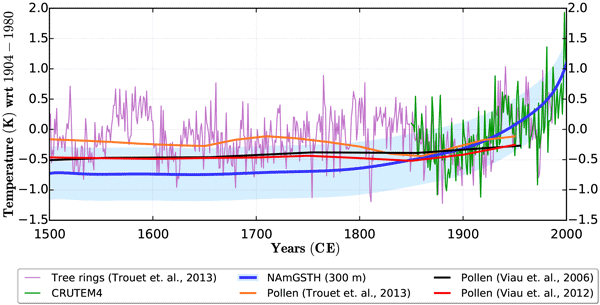 Within the framework of the PAGES NAm2k project, we estimated regional trends in the ground surface temperature change for the past 500 years in North America. The mean North American ground surface temperature history suggests a warming of 1.8 °C between preindustrial times and 2000. A regional analysis of mean temperature changes over the last 5 centuries shows that all regions experienced warming, but this warming displays large spatial variability and is more marked in high-latitude regions.